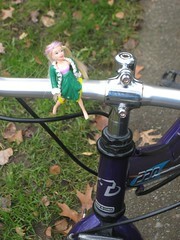 This entry was posted in bikes, kids' bikes and tagged bike decoration, kids' bikes. Bookmark the permalink. That’s so funny! Polly’s got the perfect biking wardrobe – stylish, stretchy and waterproof! Can’t wait to show this to my daughter. That’s cute! 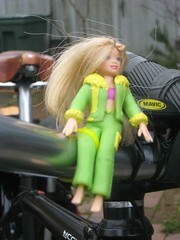 I have a little stuffed snowman on my bike, but the doll’s even better. Nice idea. I espect if my boys see it they’ll want a dinosaur on each bike. Or a fireman.